ACRL 2015 notes: liaison trends, invasion of the business librarians, too much info lit? Carol (librarian at WFU) and I traveled together to ACRL. 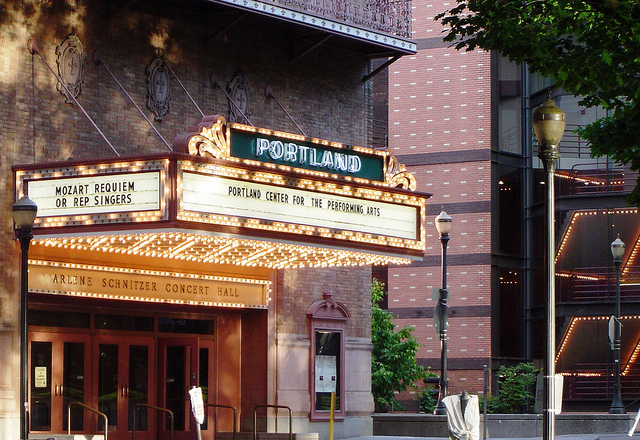 This was our second visit to Portland. Across the four days, we only had one evening of rainy weather. All attendees received public transportation passes for the duration of the conference, which made it so easy to get around to hotels and parties. All the programs were in the convention center. I enjoyed seeing several ex-interns, who looked all professional and confident as early career librarians. Most of the core business vendors exhibited. Geographic Solutions sponsored a dinner at a Hosford-Abernethy neighborhood Mexican restaurant where we sang “Happy Birthday” to Charles. En route to the dinner I enjoyed getting caught up with LMU Business Librarian Nataly Blas, whom I hadn’t seen in a while, as well as chatting with other business librarians as we strolled through the most interesting residential neighborhood we had seen in Portland. Other business vendors organized get-togethers too. The business librarians’ party at the Hair of the Dog Brewing Company on Friday evening was fun. There were around 30 of us there. The place was crowded, so we ended up in several smaller groups in different corners of the pub. Not ideal for mixing, but the best we could do given how busy the place was. Mallory and Dave from InfoGroup took good care of us. A friend from S&P joined the party (paying for his own drink), and I enjoyed getting caught up with him. A bunch of us further bonded by walking through the rain from the pub to the science museum for the all-conference reception. Despite strong presence of the business vendors and significant attendance by academic business librarians, there was no official ACRL event involving business librarianship, nor for other subject specialists. I wonder if that was a missed opportunity for ACRL. A program on data literacy was as close as the conference got to specialized content. In contrast, the conference was dominated by information literacy topics. Courtney McDonald mentioned this already in her conference summary. She encouraged folks with other interests to submit more often. However, my wife wondered if ACRL’s uber-complicated submission form contributed to the lack of topic diversity. Among many other requirements, the form required submitters to identify learning outcomes – a natural perhaps for information literacy librarians, but not a common way of thinking for other types of librarians. So maybe the submission requirements helped weed out non-info lit topics. Many of the program slides and handouts are online. I joined several roundtable discussions – a nice alternative to the panels in big rooms. One was called “Upskilling Liaison Librarians: Code, Community, and Change.” Librarians from Temple University — Jenifer Baldwin, Jackie Sipes, and Caitlin Shanley — discussed the creation of their informal “Code Rascals” group. Thankfully they didn’t advocate for the click-bait mantra of “all librarians should be coders,” but instead explained the need for liaisons in their library to be more proactively involved with local information technology services. The discussion expanded to include learning opportunities and workload issues for liaisons expanding their functional skills, ex. data curation. (This has been a topic of interest in our liaison reorganization process.) We also talked about how to make liaisons accepting of imperfect knowledge when expanding roles – not always an easy or comfortable thing to do, especially when the expectations of functional skill levels are not officially defined by management. The Code Rascals formed on their own and are charting their own course. Their library also has an informal data literacy group. Attending faculty and graduate student talks in order to learn the core concepts and lingo. Someone added that fear can be liberating and energizing, too. Ariel Orlov and Ning Zou of Dominican University facilitated a discussion on “Instruction Interns in Academic Libraries: Keeping Everyone Happy”. They provide intensive training in library instruction for interns in the fall semester; in the spring, the interns teach solo. This helps the library meet the demand for library instruction in the spring. Some of the library students already have teaching experience but have no experience with online classes. We discussed creating sustainability info lit programs, the ROI of teaching interns to teach, and how to set up the teaching-to-teach program. The UNCG reference interns primarily work at our information desk, but some each semester do practicums on teaching; I try to offer teaching opportunities to my liaison librarianship independent study students. The Dominican example is a more ambitious approach. This smart panel presented three frameworks for getting students to think thoughtfully about the research process, and the decisions they make en route. Very interesting and thought-provoking. The panel even covered some limitations of the frameworks (we appreciated their frankness). Download their presentation and take a good look at it. April is a medical librarian – one of the few special librarians to attend ACRL? – and I really appreciated her observations. We can often learn a lot from medical librarians. Adam Beauchamp (Tulane University) and Christine Murray (Bates College) presented “Promoting Data Literacy at the Grassroots: Teaching & Learning with Data in the Undergraduate Curriculum” [PowerPoint]. This was maybe the most practical program I attended (which means I liked it a lot), even though the output of the students’ research was assumed to be the dreaded research paper (as opposed to experiential learning and/or community-engaged projects business student teams increasingly develop). Check out the lesson plans described in the slides. Early on the panel noted that data curation is way beyond most undergraduates – the students first need to know how to find and then utilize data (a good reminder when our administrators get carried away pushing us liaisons into new advocacy roles). The speakers also noted the need to teach undergrads that using other people’s data is not plagiarism. And they taught me a new word, operationalize: thinking about how a research topic can be quantified and measured. The example was measuring hipster gentrification – how can you measure hipsterness? ReferenceUSA, Nielsen, and Experian came up as possible data sources. Some of the social science librarians expressed suspicions of market research data – no surprise there! Our program seemed to go well: New Models for New Roles: Creating Liaison Organizational Structures that Support Modern Priorities. [PowerPoint] Jutta Seibert from Villanova and I had dinner together at LOEX last May, but I hadn’t met Margaret Burri from Johns Hopkins before this ACRL (we had just talked on the phone when UNCG benchmarked innovative liaison organizations like JHU’s). My sharp colleague Lynda Kellam covered UNCG’s experience. All three main speakers did well and took different approaches to the topic. We responded to questions until we ran out of time. As we add new liaison roles, what work can we give up? Team structures that get too complicated can hinder getting your work done. Agreement that liaisons should not be spending much time at the reference desk anymore (at larger libraries, at least, where there’s more staffing options). The assessment email discussion list recently had a discussion on assessing liaison work. Are there other models for assigning subjects to a newly-hired liaison besides assigning whatever subjects are left over? The predominance of cross-functional teams in all three examples. Balancing (or not?) hiring for function v. hiring for subject skills. One interesting Tweet question: “Besides improving workflow and culture, have there been measurable changes for users?” Hmm that might be hard to measure. Advocating new goals like data curation, open access, and textbook affordability might be examples – it’s easier to pursue such work in a team environment and without a heavy emphasis on tradition collections and reference work. After our programs was the final keynote, and then ACRL 2015 was over.